In the early 1990’s, as Starbucks started taking off as a company, Howard Schulz (CEO) was looking out for new opportunities to leverage the brand. One of the options which the company pursued was to enter the (supermarket) retail segment. The idea was to bring cold dairy-based ready to drink coffee to the shelves. The potential for bringing the Starbucks experience to the retail shelves was great, yet this terrain without espresso machines and baristas was also unfamiliar to the company. Starbucks needed to develop an entirely new business model for entry, and forge a key partnership to do so. 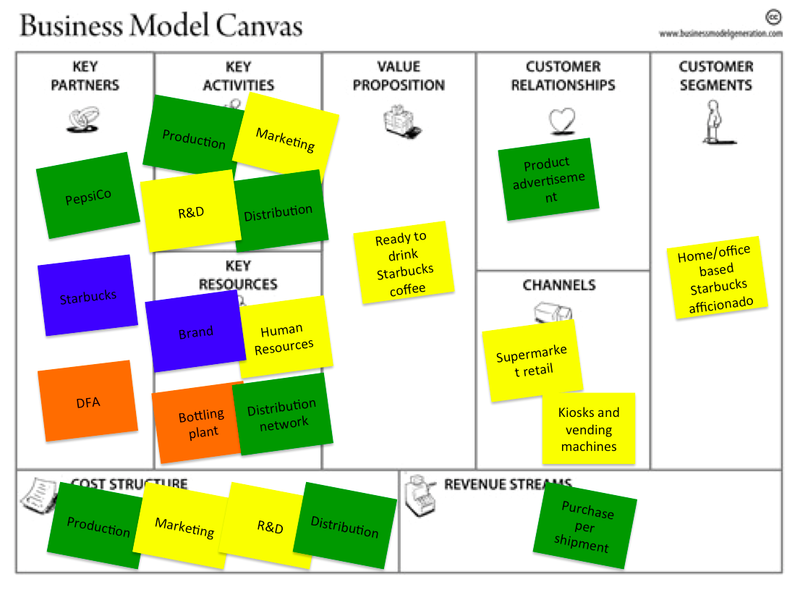 In this post I will sketch out this business model, and its partnership using my recently published Partnership Proposition Canvas (v0.4). After a period of trial and error with cold coffee drinks in the then dawning market for such products, Starbucks made a fit with a bottled version of their infamous Frappuccino. This product proved to be a hit in the Starbucks outlets in the summertime. From 1995 onwards Frappuccino would immediately be available in every home and office with a fridge. Although it would seem straightforward for Starbucks to manifest itself in this market with its own production line and channels to customers, it realized it didn’t have what it took to pull it off. Starbucks had no capabilities to develop and mass-produce bottled or canned dairy-based coffee drinks, nor to distribute them through the supermarket retail channel. The company knew it needed a partner. In order to launch its Frappuccino product, Starbucks sealed a partnership with PepsiCo (then known as Pepsi Cola) a year earlier in 1994. This partnership was of tremendous value for Starbucks’ new venture. PepsiCo had solid experience in product development, and an extensive sales and distribution network in the retail segment. Also, PepsiCo had access to a dairy bottling plant network through its partnership with Dairy Farmers of America (DFA). 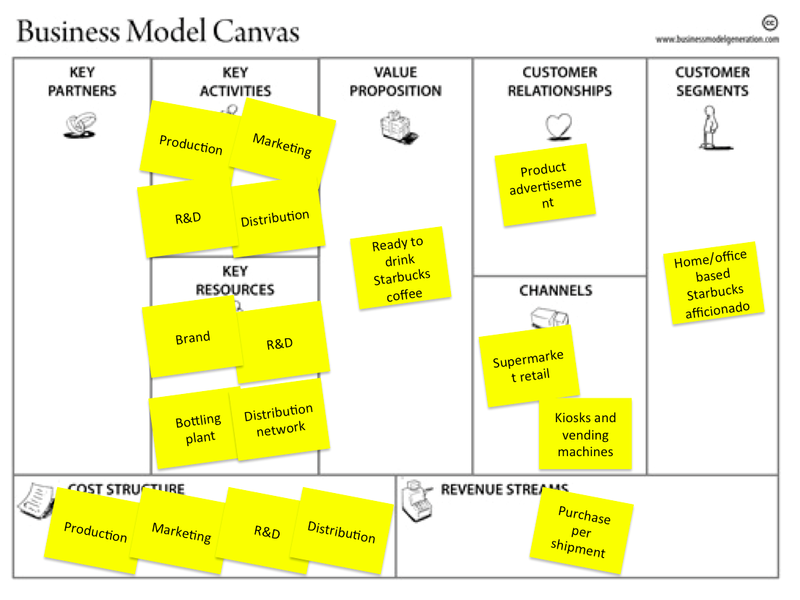 The Partnership Proposition Canvas (CC+ license) for the Starbucks PepsiCo partnership. When overlooking all the pieces of this partnership, it’s interesting to see that Starbucks could potentially have made do with arms-length relations for processing, marketing and sales, as well as distribution. That is job work. It could have been contracted out under an exclusive agreement. The critical factor determining the close nature of the partnership appears to be that of product development (marked in blue above). Starbucks has the knowledge on coffee, but PepsiCo has better capabilities for developing canned and bottled beverages. Such dependency in product development creates a notoriously vague and sensitive situation in the exchange between companies. Intellectual property boundaries are highly uncertain. The logical outcome of the tension in the partnership was thus to create 50/50 joint venture between Starbucks and PepsiCo, which was named the North American Coffee Partnership (NACP). Under this construction both companies would be assured that each would profit from the fruits of their product innovations. So it appears that we’re not dealing with a Starbucks exclusive business model with a PepsiCo partnership, but with a whole new company, with its own business model. The NACP is a dedicated company for developing and marketing ready to drink Starbucks-branded coffee. To make things more complicated, both Starbucks and PepsiCo function as key partners in the NACP business model (below). Starbucks provides a license to its brand. PepsiCo has a more extensive partner contribution. It covers production, advertising, distribution, sales. This last role is significant as PepsiCo takes physical ownership of the product. In effect, NACP only has PepsiCo as paying customer. DFA has the role of processing the product. Since its founding, NACP is continuously developing its portfolio, launching new products like the DoubleShot, and Starbucks coffee beans. Through the PepsiCo network, the joint venture is also expanding to new markets, teaming up for instance with European dairy giant Arla, in the same way as DFA in the United States. Currently the joint venture accounts for about 60% of a global billion dollar growing market for ready to drink coffee; an impressive feat for two companies that started off exploring new terrain.